Seriously, the fastest way to update a room is paint. A deep, vibrant swath of color like plum or cerulean blue creates a soothing cocoon while soft ivory or pearl gray offers a spa-like serenity. We love the hues from Farrow and Ball whose colors make for some sophisticated spaces and the names – like “Mouse’s Back” – make us smile. Similar to the effects of aromatherapy, lighting is an important mood enhancer as it sets the tone for the room, especially in a guest room where reading in bed is part of the vacay! Dimmers are our #1 lighting trick because let’s face it, any bedroom is better with flattering light. 3-way bulbs and good reading lamps are essential. And, keep controls within easy reach. If you are working with a smaller room – say 11′ by 11′ or so – it’s challenging to fit furniture in comfortably let alone store personal items in closets. This is where we opt to design built-in cabinets or shelving units to cleanly organize or even display your personal items or photographs. Instead of leaving a wall or corner unused, consider an etagere for additional storage or display. Daybeds are both chic and versatile, and have long been the favorite go-to’s for interior designers. LEE has customizable options that act as sofas by day and sleeping nests by night, yet are space saving as they are positioned against a wall. Easy off-the-shelf bedding or luxurious custom linens, duvets or shams change the look to suit your style. Perfection. Guests need a little privacy during their stay and if you are blessed with beautiful views, they may want to linger and enjoy the vista. When you consider how to decorate a guest bedroom without changing the furniture, how about changing the window coverings? Roller shades keeps the lines clean, modern and reduces heat or consider a natural woven shade of seagrass to add texture and a global vibe. Either way, be sure to opt for a programable remote so there’s no need to crawl out of bed to let in the morning sun. Fresh flowers are my most favorite thing to pick up at the last minute. They’re a happy dose of color and their soft fragrance instantly says “welcome!” Grab a pair of pruning sheers and snip whatever is in your garden – including just greens from an overgrown tree or shrub! – or scope out the seasonal offering at the farmer’s market and plop it all in a beautiful vase. Tiny effort – big impression. Seems obvious, but be thoughtful about sound and try to eliminate noise in and around the room by offering ways for your guests to tune out. We like to include a TV of course, but how about a fresh pair of ear buds tied with a ribbon at bedside? And maybe an extra pillow or two in a gorgeous custom fabric that not only absorbs sound but adds a pop of color. Add a throw to keep them cozy during chilly nights. 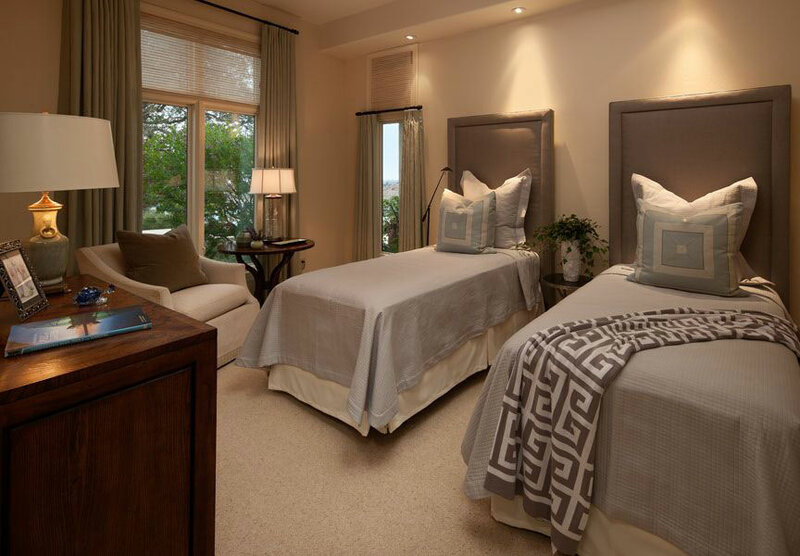 We think of a bedroom as a peaceful retreat from the world, which can mean different things to different people. No need to ask yourself how to decorate a guest bedroom to make your guests feel comfortable if you furnish the room the way you’d like to live in it. In fact, sleep in your guest room occasionally. Make sure the mattress is firm, the pillows fluffy, the linens fresh and the light bulbs working. Pretend you’re on a staycation! And let me know when I can check in.